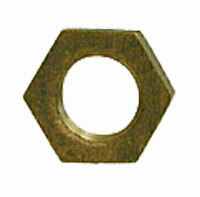 We have a large inventory of bronze hex locknuts. Our bronze hex locknuts are available in many sizes to meet your required piping specifications. Allow us to facilitate your bronze fittings needs quickly with high quality bronze pipe products that resist corrosion. Our bronze hex locknuts come in a variety of sizes for almost any piping configuration. We offer high quality bronze hex locknuts in sizes ranging from 1/8" to 2". We also offer a variety of stainless steel fittings. View our product line card. Our bronze hex locknuts are available to meet your pipe fitting needs. View our bronze fittings and other product dimensions. Please review our product dimensions. Our pipe sizes and weights chart will help in your search for individual product specifications. Our bronze hex locknuts conform to ASTM B62-93 (85, 5, 5, 5) C83600. Dimensions ANSI B 16.15, Threads are ANSI B2.1 or BA21 and Fed. WW-P-460 UL/FM approved. View our standard specifications chart. We also carry thousands of stainless steel pipe products to meet your piping system requirements. View the various grades of stainless steel. View the thousands of bronze, stainless and other alloy pipe products we offer. This Reference Catalog identifies bronze hex locknuts and other pipe fittings through specification charts and illustrations. Bronze hex locknuts also known as a lock nut is a nut that resists loosening in environments with vibrations and or torque. The fitting locks in place preventing movements from the desired placement of pipes and fittings.